I just HAD to share this in it's own thread. It needs the exposure because I don't know what limited time this will exist for. 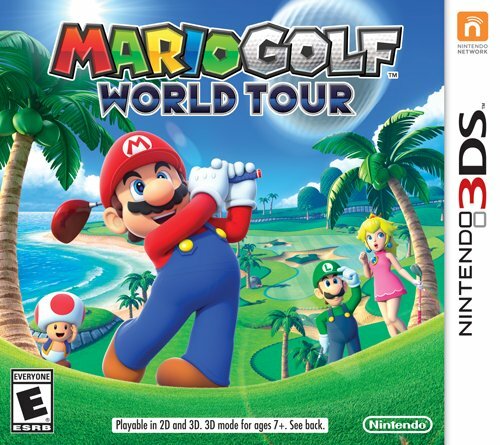 25% off the next Mario Golf game? Yes, Thank You! Buy it now! They claim the game doesn't have a release date but we all know it's less than 2 months away!!!! I marked this as news because it's for a game not yet released and exposure through Twitter should only help folks find this out! Thanks for the tip! I just ordered it. Can't wait! I have had that game pre-ordered from Amazon for almost a year now, can't wait for it to finally come out. No sweat! I had to bite immediately. This has been one of my most anticipated games since it's announcement. I really wish Nintendo would hop back on the Amazon bandwagon and put their digital stuff on there like how PSN is on there. I saw this about a week ago but forgot to post it here. Whoops! Hmmm... but how to get to that free shipping mark? Maybe preorder a bag of candy with it. Life is a little more joyless since Amazon raised the free shipping to orders over $35 and started charging sales tax. @Hinph Yeah, I feel the same way. Since I always wait for sales then even at the $25 point I typically had to find at least two games on sale to be able to get the free shipping. Now that it's $10 more I need to hope that even more games are down to low prices at one time. I wasn't aware it changed. I have been a Prime member for a few years now. Its been worth it in the past. But yeah, some candy or perhaps some random little trinket you've wanted? Anyway, I might have to jump on this. I wonder if I can get into golf games like I have in the past though. A lot of my engagement with them involved multi with my cousin, and he would never sit around playing 3DS games. The RPG-esque character builder I guess is back from the original handheld ones and people always loved it. Might give you more bang for your buck. Oh, I just assumed that was the retail price. I'll grab it now. Totes! I was similarly miffed until my sister got Prime, and I sponged off of her (as I sponge off of her Netflix account). God(s), Prime is so convenient. They should really make it cheaper. I've been buying a hell of a lot more stuff. Ooo, is it really? I totally missed that! Is this what it feels like... when doves cry? I still have a Border's gift card that a parent gave me um... geez I think this was back when I was doing the PE teaching, so like 6 or 7 years ago? I should figure out what I can do with it one of these days. You used to able to exchange that as credit somewhere, I think. But that time has probably passed. Not a day goes by that I do not mourn that loss. I'm going to get World Tour via Gamefly as I always do (discount plus monthly coupons) but this is a pretty good backup plan should something there go amiss. Do you remember when all handheld games launched at $30?